People often compare plastic and rubber with Polyurethane because it is superior in quality and functionality than these materials. Polyurethane as a raw material is used to make a wide variety of products, from wheels, liners, pads and many more because it has high load bearing ability and longer serving capability. One impressive and amongst the most famous qualities of Polyurethane is it's resistant to heat, chemical, water, scrapping and corrosion. To get perfectly shaped and a variety of Polyurethane Products, Suryakiran Industries is the perfect destination for customers. Formed in the year 2017 at Ahmedabad (Gujarat, India), the company is leading as a Sole Proprietor Company by Mr. Rajendra. The company is serving in Indian market as a Manufacturer and Supplier of Polyurethane Suspensions, Polyurethane Rods, Polyurethane Hammer, Polyurethane Coated Rollers, and other Polyurethane products. These products are designed and developed as per market trends and demands of the customers within scheduled time. The company has hired 10 knowledge experts to well-handle business operations from production to delivery. Where We Serve The Most? Brand name is very important in the modern world because it leads to better marketing, promotion and sales of products. Keeping this in mind, we are marketing and selling our well-designed Polyurethane products under two brand names which are Suryakiran and Martil. 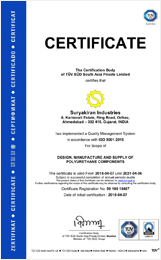 Suryakiran Industries is a new member in the family of Polyurethane products manufacturers and suppliers but it has complete knowledge of how things run well in this family. We believe in healthy competition which is why we supply all our offerings, Polyurethane Suspension, Sheets, few to cite, at industry leading rates.